Related to entry, exit and residence of foreigners in Vietnam, the Standing Committee of Vietnam National Assembly issued a National Ordinance No. 24/2000/PL-UBTVQH10 on the 28 April, 2000. The Ordinance includes 07 chapters and 26 articles stating specifically who is responsible for what in term of Vietnam visa issuance, and who and how long can get a visa for Vietnam. The 26 articles explains for a potential Vietnam visa applicant know why a travel agency can assist you to get Vietnam visa approval letter by applying for Vietnam visa on arrival. To help visitors to Vietnam save their time and money on getting a Vietnam visa, Vietnam Visa on Arrival or Vietnam visa on arrival online has been put into use for years. 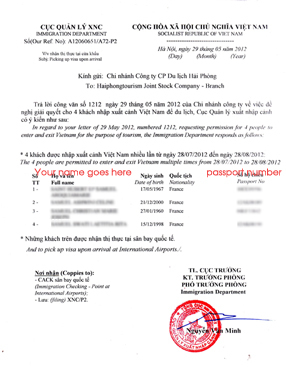 Vietnam visa on arrival is legitimate and posted in Vietnam immigration laws at the official website of Vietnam Ministry of Foreign Affairs - so it is endorsed by the Vietnamese Government. The name of this visa type itself answers the question “Where to get Vietnam visa?”, since “Vietnam Visa on arrival” means “The Vietnam visa picked up upon arrival at the airport in Vietnam”.